“INDIRA CESARINE x NEON” is a solo exhibition of works by artist Indira Cesarine, curated by Jenny Muskin Goldman of Kin + Gold, opening February 14, 2019, and on view through April 13, 2019, at Le Board. The exhibit, which is presented in collaboration with The Untitled Space gallery, will be the inauguration of their resident artist series of exhibitions presented at the luxury living brand’s flagship on 5th Avenue, located off Central Park South. 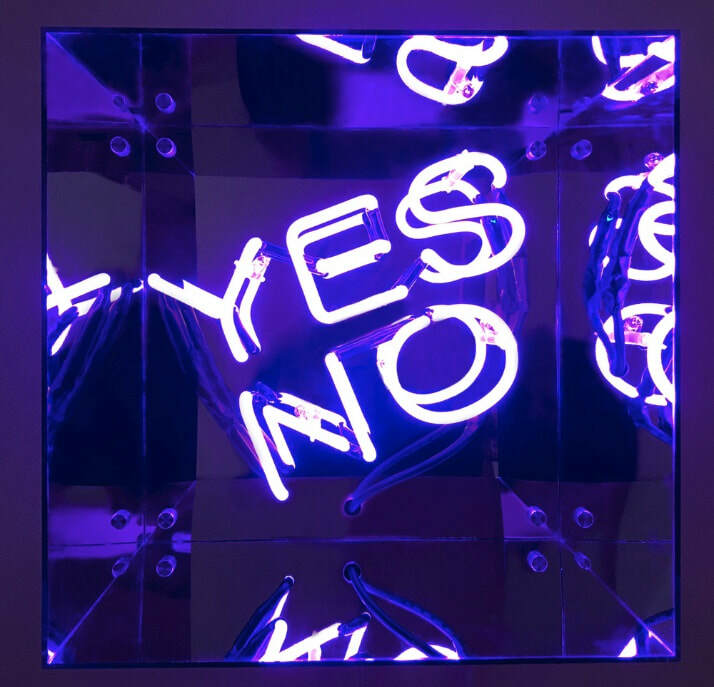 The exhibit will present a collection of original neon artworks created by the artist between 2017-2018. Known for her empowering feminist themes, Indira Cesarine’s artwork engages a narrative of social discourse and art activism. Cesarine’s artwork has been featured internationally at many galleries, museums and festivals, including The Metropolitan Museum of Art, Mattatuck Museum, Paul Mellon Art Center, CICA Museum, San Luis Obispo Museum of Art, French Embassy Cultural Center, Art Basel Miami, Cannes Film Festival and the International Festival Photo Mode to name a few. The Guardian, Flaunt, Hunger and Widewalls. “Empowering feminist themes are often a point of departure for my multi-sensory series. My work questions the place of humanity in context with contemporary civilization and is often influenced by autobiographical content and women’s history at large. As a multi-disciplinarian artist I often work across several mediums and techniques to convey a rich and diverse narrative. I connect with thematic subject matter that engages a narrative of social discourse and art activism. Through my exhibitions and artwork, I challenge the status quo, as well as tackle stereotypes and double standards. I draw from historical narratives in an effort to create empowering artwork that can have an impact on the viewer, be a catalyst for change or provide insight into history, which may have been overlooked. As an artist I find it is more effective to communicate my ideas through visual and sensory explorations that can uniquely address the world we live in today. In 2014, I was invited to create a sculpture for the Fabergé Big Egg Hunt, which was exhibited at Rockefeller Center alongside artists such as Jeff Koons and Zaha Hadid. I became totally inspired by the process of creating 3-dimensional art, which was a massive leap from my former career as a photographer. Over the past several years I have been studying and exploring techniques in clay and casting, welding in steel, 3D printing, as well as neon glass bending. Jenny Mushkin Goldman is an independent curator and art advisor based in New York City. In June of 2017, she presented En Caul, a solo show of paintings, drawings, and hybrid-sculptures by Adam Krueger, which was the inaugural exhibition of her gallery project Kin + Gold. In April 2017, she co-curated with Romain Dauriac the group show Singular Object, which was organized in celebration of the future New York City building, 53W53, designed by the renowned architect Jean Nouvel. ​Amulets Ethereal at Barney Savage Gallery in May 2018; Beyond Secretary at Mark Borghi Fine Arts in the Fall of 2016, featuring works by Elaine de Kooning, Rebecca Goyette, and Betty Tompkins; Smile!, which was presented by Shin Gallery in Spring 2016 and included works by Deborah Kass and Hyon Gyon; Papercut (co-curated with Vaughn Massey) at the National Arts Club, New York (October 15 – 26, 2014) and The Space Between (co-curated with Ryan Bradley) at the National Arts Club, New York (December 3 -14, 2012).